Russell Moccasin Company exhibits at a number of major conventions each year. Stop by our booth at any one of these conventions or events to look over the Russell product line and be measured for a true custom fit by one of our professional measurers. 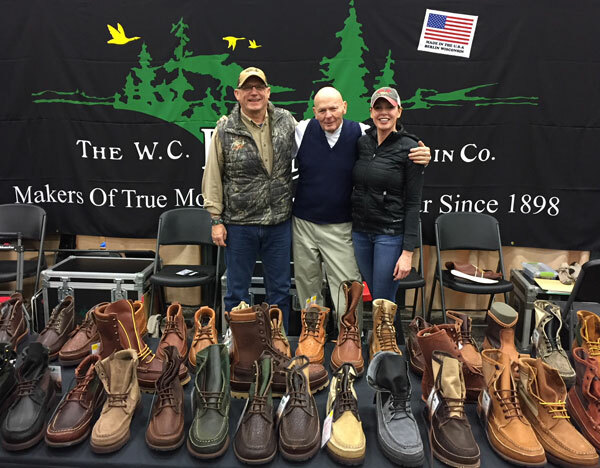 The Russell Moccasin sales staff shown here at the 2018 Dallas Safari Club Show. Pictured left to right are Joe Gonyo, Ralph "Lefty" Fabricius, and Suzie Fabricius. We look forward to seeing you at the shows. Stop by to see us! Stop by our exhibits below and check out our new exciting styles!